by Chris Woodford. Last updated: February 4, 2019. If something's too hot to handle, it's no good trying to measure its temperature with an ordinary thermometer. You could try a thermocouple instead—a kind of thermometer that works by generating electricity according to how hot it gets. But what if the thing you're trying to measure is too hot or too inconveniently placed even to measure with a thermocouple? What if it's the inside of a steel furnace or pottery kiln, the roof of a cathedral, or a cloud? In that case, you can measure the temperature remotely with a handy gadget called a pyrometer (from the Greek words meaning "fire" and "measurement"). Infrared thermometers, which sample temperature remotely, are now probably the best known examples. How exactly do they work? Let's take a closer look! Photo: Hot stuff—setting up a pyrometer experiment at NASA. Photo by courtesy of NASA Glenn Research Center (NASA-GRC). You can feel a fire some distance away because it gives off heat radiation in all directions. In theory, if the fire behaves exactly according to the laws of physics, the radiation it produces is related to its temperature in a very predictable way. So if you can measure the wavelength of the radiation, you can precisely measure the temperature even if you're standing some way off. That's the theory behind a pyrometer: a very accurate kind of thermometer that measures something's temperature from the heat radiation it gives out at a safe distance (in some pyrometers) of up to 30m (100ft). There are two basic kinds of pyrometers: optical pyrometers, where you look at a heat source through a mini-telescope and make a manual measurement, and electronic, digital pyrometers (also called infrared thermometers) that measure completely automatically. Some devices described as pyrometers actually have to be touching the hot object they're measuring. Strictly speaking, instruments like this are really just high-temperature thermometers based on thermocouples. Since they don't measure temperature at a distance, they're not really pyrometers at all. Photo: Pyrometers are really useful for measuring the temperature of an object at a distance. 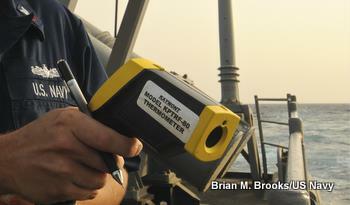 Here, a member of the US Navy is using one common type of pyrometer (an infrared thermometer) to measure the sea temperature from the deck of a ship. This military-issue device can measure temperatures from −18°C to 870°C. Photo by Brian M. Brooks courtesy of US Navy. Until microchips and compact electronic equipment became popular in the 1980s, a manual optical pyrometer was what you used if you wanted to measure the temperature of something extremely hot and relatively inaccessible, such as the inside of a steel furnace or a pottery kiln. It measured the temperature, at a safe distance, by comparing the radiation the hot object produced with the radiation produced by a hot filament (a thin wire through which electricity flows, like the wire in an old-fashioned incandescent light bulb, which glows white when it gets hot). How does a manual pyrometer work? You look through a telescope eyepiece, through a red filter (to protect your eyes), at the object you're measuring (typically through a spyhole set into a kiln or a Tuyère in a furnace—the nozzle where air is blown in). What you see is a dull red glow from the hot object with a line of brighter light from the filament running right through it and superimposed on top. You turn a knob on the side of the pyrometer to adjust the electric current passing through the filament. This makes the filament a bit hotter or colder and alters the light it gives off. When the filament is exactly the same temperature as the hot object you're measuring, it effectively disappears because the radiation it's producing is the same color. At that point, you stop looking through the eyepiece and read the temperature off a meter. The meter is actually measuring the electric current through the filament, but it's calibrated (marked with a scale) so that it effectively converts current measurements into temperature. Photo: A NASA scientist uses an optical pyrometer to measure the temperature of a rocket cone in a 1956 experiment. Photo by courtesy of NASA Glenn Research Center (NASA-GRC). Artwork: How it works: 1) Look through the eyepiece at the hot object; 2) Turn the thumb wheel to adjust the filament temperature; 3) As the temperature changes, the glowing red filament slowly merges into the orange background; 4) At this point, the filament is exactly as hot as the object you're measuring—and you can read its temperature off the dial. Instruments like this are known as disappearing-filament optical pyrometers and were invented at the end of the 19th century by Everett F. Morse. Accurate and convenient, they make it easy to measure temperatures of over 3000°C (5400°F) at a safe distance. But, on the downside, they can be expensive, have to be calibrated properly, need some skill to use, and are affected by ambient (background) temperatures. 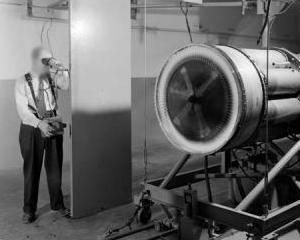 Photo: Optical pyrometers haven't changed much. Here's Everett F. Morse's original pyrometer, as he explained it in his patent for an "Apparatus for Gaging Temperatures of Heated Substances" (patent number 696916) from 1902. In this design, you look through a tube (3) at the heat source you want to measure. Using a dial (7) attached to a variable resistor (6), you adjust a light filament until it disappears against the background radiation. At that point, you read the temperature off the meter (9). Picture from US Patent #696,916: Apparatus for gaging temperatures of heated substances courtesy of US Patent and Trademark Office. Photo: Infrared thermometers (pyrometers) being used in a NASA experiment. Photo by Cesar Acosta courtesy of NASA Ames Imaging Library System (AILS). These days, it's more common for engineers and scientists to use entirely automatic, digital pyrometers. which are quicker and simpler, and use two different types of detectors. Some measure heat by absorbing light, so they're essentially light detectors: semiconductor-based, light-sensitive photocells, a bit like tiny solar cells, but with filters fitted in front so they respond only to a certain band of visible, infrared, or ultraviolet radiation. By sampling radiation far outside the visible spectrum, detectors like this can measure a bigger range of temperatures than older, manual pyrometers. 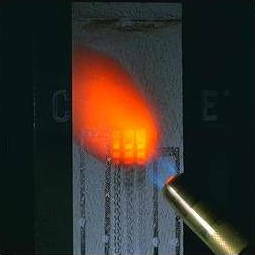 Other pyrometers use detectors that measure heat by absorbing heat, using such things as thermocouples and silicon thermopiles (collections of thermocouples) or thermistors (heat-sensitive resistors). Photo: Taking the temperature of a ceiling-mounted ventilation system with a handheld digital pyrometer. 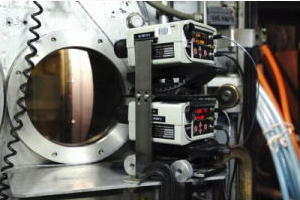 The red spot you can see is a sighting device that helps the operator position the pyrometer precisely. Photo by Lamel J. Hinton courtesy of US Navy. Modern pyrometers come in various types and designs. Some devices measure the full spectrum of emitted radiation, so they're called total radiation or wideband pyrometers; they tend to use heat-based detectors such as thermopiles. As their name suggests, narrow-band pyrometers capture a much smaller and more specific band of radiation, typically using photocells. Exactly which radiation band you need to sample depends on the temperatures (and materials) you're trying to measure (the hot alloys in jet engine turbines would be very different from factory cutting tools, for example, which would be different again from something like the temperatures in a chemical plant, and also different from natural things such as steaming geysers and spurting volcanoes). While some pyrometers measure a single band of radiation, others can make more accurate measurements by comparing two wavebands (in other words, two different spectral "colors"); those are called ratio pyrometers or two-color pyrometers. Some pyrometers are designed to make quick one-off measurements, so they're shaped like pistols, with built-in detectors, signal amplifiers, power sources, and temperature meters. You point them at the object you want to measure and press the trigger. Many industrial processes rely on constant, precise temperature measurements and control. For those sorts of applications, handheld "pistol" pyrometers aren't suitable. Instead, optical fibers (or similar light guides), permanently fitted to whatever machine or process they're monitoring, are used to gather radiation from a hot area and channel it to a remote detector, typically connected to some sort of electronic control system that automatically regulates the overall process. Infrared thermometers typically work by sampling two different wavelengths from a hot object and comparing them. In one common design, radiation from a sample passes through a lens on the front of a pyrometer and an optical chopper (a rotating disc with alternating sections containing different optical filters, driven by an electric motor). This interrupts the beam dozens of times each second so the detector is alternately receiving two different wavelengths (that is, colors) of light from the same sample. An electronic circuit attached to the detector can accurately deduce the temperature of the object you're trying to measure using Planck's law (a mathematical formula that shows how the radiation emitted by an object is related to its temperature). 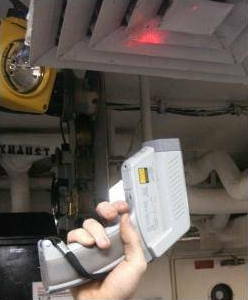 Other infrared thermometers, like the one illustrated here, compare the heat radiation from the object whose temperature you're trying to measure with the radiation produced by an internal heat source (whose temperature is precisely known) or the background level of infrared inside the pyrometer's casing. 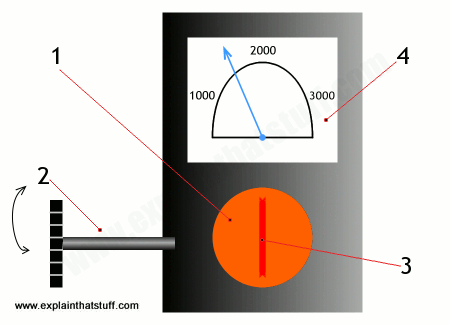 Artwork: How an infrared thermometer works. This one uses a simple, tilting mirror to compare a reference heat source inside the case with a hot object outside. It's loosely based on the design described in US Patent: 4,005,605: Remote reading infrared thermometer by Donald S. Michael, Mikron Instrument Company. You press in the trigger to put the detector into "reference" mode. An internal heat source, whose temperature is known, fires out infrared radiation. A mirror picks up the infrared. A detector picks up the reflected infrared from the mirror. A microchip notes the reading of the internal reference source. Now you release the trigger to put it in operating mode. The mirror swings back to face the front of the detector. The hot sample you're interested in gives off its own pattern of infrared radiation. The infrared fires in through the front and bounces off the mirror into the detector. The chip compares the infrared wavelengths from the reference source and the sample and figures out the sample's temperature. Are infrared thermometers suitable for medical use? Hunt around on online shopping sites and you'll find plenty of praise for infrared thermometers: we seem to be using them for everything from checking out heat-leaky buildings to monitoring the progress of our cooking. In the Q&A sections of sites like this, people often ask whether infrared thermometers are accurate enough for medical purposes, and here there is certainly some dispute. A review of some 44 published studies reported in The Lancet in 2002 concluded that "infrared ear thermometry does not show sufficient agreement with an established method of [rectal] temperature measurement to be used in situations where body temperature needs to be measured with precision." A 2007 study reported by The New York Times, Doctors Warn Against Infrared Thermometers, also noted concerns, expressed particularly by sports physicians, that infrared devices routinely give lower temperatures than rectal thermometers, which can lead to a failure to spot potentially life-threatening conditions like heatstroke in athletes. Other studies have been more positive, including a detailed 2014 Canadian review, which pointed out that "Depending on the context... the volume of measurements to be done and the age of the person to be measured, it might be imperative to use infrared thermometers over more accurate and/or more invasive thermometers." They're particularly useful for children and others who have difficulty sitting still long enough for a conventional temperature measurement (typically a minute or so); they don't need to be sterilized if there's no contact; and they allow large numbers of people to be scanned in a short time (for example, as part of fever screening at an airport). The short answer seems to be that infrared thermometers are very useful in some situations, while conventional thermometers are better in others. Who invented the first pyrometer? Long before disappearing filament and electronic pyrometers were invented, potters needed to measure the temperature of their kilns to make sure their clay pots would fire properly. So it comes as no surprise to find that the first pyrometer was invented by the great English potter Josiah Wedgwood (1730–1795), some time in the late 1770s or early 1780s. Now Wedgwood knew that porcelain contracts when it's fired and the amount of shrinkage depends on the kiln temperature, so he figured out that he could easily measure the temperature of a kiln by putting pieces of porcelain inside and measuring how much they'd shrunk. In an 1828 book about temperature measurement, Thomas Stewart Traill describes the idea: "It was found, after repeated trials, that the pieces of clay contracted more and more in an uniform ratio to the degree of heat communicated to them, and permanently retained this contraction; so that by applying them when cold to a scale, an indication of the degree of heat was obtained." In those days, pottery was a hugely important industry in Britain and this invention earned Wedgwood a Fellowship of the Royal Society (FRS)—one of England's most prestigious scientific honors—in 1783. But there is some doubt about whether he deserved the credit: in an 1837 book titled The Chemistry of the Several Natural and Artificial Heterogeneous Compounds used in Manufacturing Porcelain, Glass, and Pottery, Dr Simeon Shaw suggests the idea might actually have come from Thomas Massey, a man who worked in Wedgwood's factory, and at least one other book I've found from the early 19th century (Sir D.K. Sandford's Popular Encyclopedia, from 1836) also credits Massey with the idea. Pyrometers—The Measurement of High Temperatures by G. K. Burgess. Wexford College Press, 2006. Covers all the different kinds of pyrometers and how to use them. Temperature Measurement & Control by James R. Leigh, Institution of Electrical Engineers, 1988. Describes thermometers, thermocouples, pyrometers, and other temperature sensors. Temperature Measurement by Bela Liptak (ed). CRC Press, 1993. Chapter 11, "Radiation and Infrared Pyrometers," by T.J. Claggett et al, is a good introduction. US Patent: 4,470,710: I. R. Radiation pyrometer by Kenneth Crane, Peter J. Beckwith, Commonwealth Of Australia, September 11, 1984. An example of a chopper-wheel pyrometer that compares two wavelengths of infrared radiation from a hot object. US Patent: 4,005,605: Remote reading infrared thermometer by Donald S. Michael, Mikron Instrument Company, February 1, 1977. An infrared thermometer that compares radiation from an internal heat source and an external sample to figure out the sample's temperature. US Patent: 3,849,000: Digital display optical pyrometer by Paolo Soardo and Mario Pasta, November 19, 1974. A typical modern digital pyrometer using a photodiode. It compares two reflected signals to find the temperature of an unknown object. US Patent: 3,486,378: Tool surface temperature measuring apparatus by Gerald J Carlson, General Electric, December 30, 1969. An infrared pyrometer for measuring the temperature of cutting tools.